Dinosaurs have, in recent years, become a media subject rivaling the space program in popularity and eliciting similar levels of public adoration towards its researchers and scientists. The science of dinosaurs and other prehistoric life is also directly linked to other controversial scientific topics such as evolution, fuel production, climate and even the space program (i.e., what allegedly killed them). And, like the space program, it also has its critics who believe that the subject is a hoax and waste of money and that dinosaurs never existed. However, the web sites I've found that discuss the hoax angle mostly seem to be written from a religious perspective even though they may also contain some quite interesting secular arguments as well like this site. Since religion is a personal, faith-based activity with many divergent views in and of itself, I thought I would try starting a thread for discussion of this subject that excludes religious concepts and focuses in on secular ideas and observations that everyone can ponder, discuss and hopefully agree on. Is there a dinosaur hoax? Did dinosaurs really exist or not? Are dinosaurs yet another pseudo-scientific scam? If so, what might be the means and motives? Since the subject is regarded by the public with much the same reverence as the space program, I have lately been reading up on it with a skeptical eye. I haven't yet reached a solid conclusion as to whether they did or didn't exist but I currently suspect it is somewhere in between those two extremes and probably closer to the latter than the former. Looking into this subject has revealed some odd, improbable and in some cases absurd (to me) information put forth as scientific fact and I thought I'd note a few of these to see if anyone else is interested enough to discuss or contribute their own views. "The first nearly complete North American dinosaur skeleton"
We're told that the first North American discovery of a dinosaur skeleton which “proved dinosaurs were real” was by William Parker Foulke in 1858. It seems that 20 years earlier a man named Hopkins found some large animal bones in a marl pit in New Jersey and had them on display in his home. Foulke learned of this and went to the site and allegedly pulled out “the first nearly complete skeleton of a dinosaur” called a Hadrosaurus. This skeleton became the first to be put on public display and caused quite a sensation. So, the landmark dinosaur skeleton that “proved to the world that dinosaurs are real” is acknowledged as a misrepresentation and they can't even say when the errors will be corrected? But, it's still on display to the public anyway? I guess the paleontological world is just too busy with TV appearances to fix this supposedly historic and hugely significant find that paved the way for dino science. Or, might this admitted misrepresentation with its odd "unspecified future date" of correction be because they simply can't fix it? Perhaps because then they'd have to publicly acknowledge that the whole thing is a fake? How would it look if the history making “discovery” that founded their science turned out to be a phoney? Many of them are depicted as having this same sort of body layout with most of the animal's weight ahead of its center of gravity and tiny, nearly useless-looking forelegs. Is it just me or does this seem absurd to anyone else? Dino scientists tell us that such animals used their tails to balance out their weight so they could stay upright. In other words, they had to keep their tails sticking out horizontally when they walked around to keep from toppling over. Does this seem likely? Are any current animals built this way and walk around doing a balancing act with their tails held out just to stay on their feet? Isn't it hard enough to find food and a mate and care for one's young and keep from being eaten to have to do this balancing act all the time? Falling over at the wrong time can be fatal. What if they had to swing their tails to defend themselves? Wouldn't they then just fall over? I'm having a hard time accepting this and believing that so many animals allegedly built this way could have survived for millions of years. OK, we have this term "fossilization." Dinosaur bones are fossils which means they are fossilized. But, what does that mean? Fossilization is a process which is described in simple terms here. - Over time, more and more sediment covered the remains. - In the right circumstances (no scavengers, quick burial, not much weathering), parts of the animal turned into fossils over time. - After a long time, the chemicals in the buried animals' bodies underwent a series of changes. As the bone slowly decayed, water infused with minerals seeped into the bone and replaced the chemicals in the bone with rock-like minerals. The process of fossilization involves the dissolving and replacement of the original minerals in the object with other minerals (and/or permineralization, the filling up of spaces in fossils with minerals, and/or recrystallization in which a mineral crystal changes its form). - This process results in a heavy, rock-like copy of the original object - a fossil. The fossil has the same shape as the original object, but is chemically more like a rock! Some of the original hydroxy-apatite (a major bone consitiuent) remains, although it is saturated with silica (rock). So, in most cases the remains of ancient animals must have been fossilized to be dug up in modern times. There are evidently a few exceptions to that but those are rare. 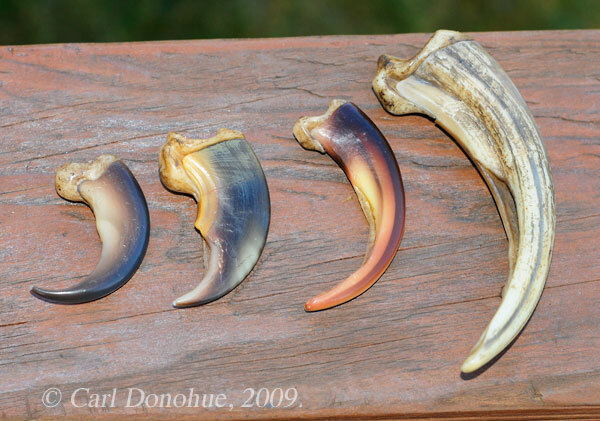 Wouldn't a bear claw fossil look an awful lot like a velociraptor claw fossil? And, wouldn't both of them be rocks? And, a few quick web image searches will also show you that dinosaur spines and ribs look a lot like those of a whale. Dino foot bones resemble those of crocodiles or large lizards. Leg bones of one animal look much like leg bones on many other animals. All a faker would really need is a good skull to complete the animal and many dino exhibits admit that at least part and in many cases, all of many dino skulls are fabricated anyway since complete skulls are very rare. So, again, I'm just conjecturing here to show that fakery in this field is possible, especially since dino remains seem to be mostly discovered and processed by publicly funded museums and government subsidized expeditions and that fossil hunting is mostly carried out on government controlled land by government licensed, institution-connected persons. Last edited by lux on Wed Apr 03, 2013 12:52 am, edited 2 times in total. Interesting theory. I've recently been reading about and watched a couple of documentaries about the "other history" of dinosaurs, mostly putting forth a religious argument that the dinosaurs lived on earth with man for some time, and perhaps may still exist in remote corners of the world. What I don't understand is what would be the point of faking such a thing? What is the motive? With NASA, we have a clear motive which is just bilking the public for more money to spend on weapons and using NASA as a cover for military operations. What would be the purpose of convincing people that dinosaurs existed? anonjedi2 wrote: What would be the purpose of convincing people that dinosaurs existed? I have come to the point in my thinking that when I see a theme or event being pushed by Hollywood and the news media I assume it is for some social engineering purpose. It has become automatic for me. In my view these entities do not produce anything purely for entertainment or informational purposes. And, for me that is the case whether the motive is clearly apparent or not. In some cases the motive becomes clearer in time. For example, the motive for the 1970s movie “The Towering Inferno” was not at all clear when it was released but it certainly is today. The same could be said for many other popular Hollywood & news media topics such as the assassinations of the 1960s, the terrorist-themed media crapola of the 1970s/80s/90s and so on. The perps evidently work with a long lead time in their psy-ops that seems to run about 50 years or more. So, to answer your question – I'm not sure why they might fake dinosaurs but I don't need to know why something is being done in order to investigate if it is being done and I suspect that any relevant motives will become clearer as time passes. I hear what you're saying. Can we speculate? Will we see a return of the dinosaurs one day? anonjedi2 wrote: I hear what you're saying. Can we speculate? Will we see a return of the dinosaurs one day? How could they return if they didn't exist in the first place? Why would they fake things like dinosaurs? Why would they fake things like - There's a man in the sky who made the universe and make a religion out of it ? Nobody knows what the universe is! All part of the game of keeping us stupid as to the real nature of reality, somehow I think there is something we're not being told! I'm speculating, perhaps something like circular time, groundhog day on a bigger scale. It may have to do with maintaining the idea of pre and post-flood history. Dinosaurs bolster the idea of a complete fossil record which (conveniently) has no evidence of civilization dating beyond roughly 10,000 years. Of course, there's plenty of evidence of massive, organized civilizations along earlier coastlines now under sea, but that evidence is contrary to the official story. Dinosaurs fill the gap. Admins, please capitalize the first word in the title of this thread, and delete the last word. I'm so glad you brought this up, and in the manner you did. I have been pondering this for a while myself, and I am starting to doubt dinosaurs for a number of reasons. One of them is our fake history. Another is the questionable biology. Even in an expanding Earth theory, where the age of dinosaurs would have featured a smaller Earth, there would apparently be a big question about how some of these monsters' hearts could possibly operate against gravity and get blood up to their heads towering above. However, these biological questions, and even the balance questions you brought up, are invitations for endless debate about circumstances. If it is a hoax, it is a double-edged hoax filling the gaps in our knowledge of geology and ancient biology. The dinosaur questions have been posed as anchors for Earth geology and planetary history. It's also interesting how many dinosaurs have been constructed from bizarre Frankensteinian methods and have later turned out to be mistakes or hoaxes dressed up as mistakes. Again, thanks for the starting the thread. And no thanks to anonjedi for their useless counter-questions thusfar. We grow up believing that the world can end. If something can kill all the dinosaurs then we don't stand a chance. For many years it was taught that the extinction event that killed the dinosaurs was 65 million years ago. Over the past few years, paleontologists have been revising their view of what actually happened during one of the five worst extinctions of Earth’s history. 'Dinosaurs were killed by an asteroid 65 million years ago' is now an indicator of outdated understanding. For one thing, geologists have recalibrated the end of the Cretaceous Period (the final stage of the Mesozoic Era) to 66 million years ago. Granted, from the perspective of deep geologic time, a million years might not seem like much, but given that this was a world-changing event, we might as well get the date right. The new date is easy to remember. The number “66” followed by 6 zeroes. And, yes, the wiki and many other sites have now been updated with this new date. You know, that same religion which I'm assuming is Christianity you're referring to also told us to be on the lookout for junk posing as science. The theory of Evolution is a prime example of this, a religious philosophy I exposed as such in my thread titled Exposing the Pagan Roots of Evolution, showing it to be nothing more than Hinduism in origin pawned off as 'science falsely so called'. The similarities to very old Pagan beliefs will never be brought up in any class room as doing so would be akin to self-incrimination. The entire accusation of the old age of the dinosaurs and henceforth the earth itself is based on this rubbish, that they are 65, no excuse me, now 66 million years old according to the article lux posted. Every time a discovery is made its always interpreted not based on what is actually found but on a deep timeline that doesn't exist. If these Dinosaurs are anywhere near as old as they claim they are, then they wouldn't be finding soft tissue in the bones. Soft tissue doesn't last for millions of years. For me, this is where the fakery on the issue of Dinosaurs lies, beyond the many other hoaxes pulled by these creatures like the infamous Piltdown man that was taught in the schools for decades as absolute fact until it was exposed as an absolute fraud. Last edited by Dcopymope on Thu Apr 04, 2013 9:29 pm, edited 1 time in total. "referring to also told us to be on the lookout for junk posing as science." And common sense tells us to look out for junk posing as religion. I think it was meant for MAGIK but it applies to religion also : The art of turning superstition into coin. T-Rex has apparently been reduced to a chicken, at least 66 +6 zeroes in years later. For some time now, dinosaurs have been slowly nudged (by alleged discoveries) to a more bird-like past existence rather than lizard-like. Perhaps this is to bring them narratively closer to resembling our present world and therefore - bridge potentially absurd times proposed for evolution to have taken effect. And perhaps it isn't merely 'new discoveries' steering art direction that is media-morphing them from non-lizard lizards to non-bird birds in computer-animations and speculative illustrations. Paleontologists have had a good year, bringing a slew of new dinosaurs to the books. We pored through the many finds to bring you the best horned, bird-footed, feathered and, of course, ferocious new dinosaurs unveiled this year. Brilliantly vague language, but PM is no stranger to it, and as you'll read in these extracts, the cavalierly used phrases like "scientists think ..." and "but this dinosaur..." hearken back to the Age of the Atom propaganda films, where everything was meant to be taken for face value. The pictures must be seen to be believed; the gist is that every available association they can make to modern animals is thrust in our face, yet written as if such associations must be avoided. A comical dance of words to be sure. For your hilarity, I will highlight the times this phraseology is used to draw in our minds huddled brains feverishly and expertly determining the activities of creatures nobody has ever seen. Canadian researchers Nick Longrich and Philip Currie discovered the smallest dinosaur ever to be found in North America--a petite meat eater just half the size of a house cat. Unlike massive carnivores, Hesperonychus elizabethae weighed 4.5 pounds and stood roughly 1.5 feet tall. The Canadian team also held the previous record for North America's smallest dinosaur, but this year's find inched under last year's record-breaking insectivore. Researchers guess that hesperonychus, with its two-legged gait and razor-sharp claws, munched on whatever it could take on: insects, small mammals, amphibians and perhaps even baby dinosaurs. Well, well. What useful extrapolation. It munched on everything of its size. Perhaps even baby dinosaurs. We're sure about the other things. Veteran dinosaur discoverer Paul Sereno recently uncovered not one but two new species in China, including one that looks a lot like a shrunken T. rex. Named Raptorex kriegsteini, this pint-size predator weighed an estimated 150 pounds but was otherwise the spitting image of the 6-ton tyrannosaur, complete with stumpy arms, muscular legs and giant jaws. The 10-foot-long dinosaur used the same hunting techniques as T. rex and supports the notion that tyrannosaurs had short arms for a large part of their evolutionary history. Raptorex roamed the Earth at least 50 million years before the T. rex, though scientists think there are plenty of medium-size versions in between. In this case, evolution decided bigger was better since the slight raptorex had descendants 90 times its original mass. Just how they could know "hunting techniques" is pretty baffling to consider. In the sands of the Gobi desert in Mongolia, paleontologist and National Geographic explorer-in-residence Paul Sereno and his team discovered a 3-foot-long nut-cracking dinosaur. Psittacosaurus gobiensis, also known as the "parrot reptile of the Gobi," resembles a less beaky version of the modern-day macaw and is the first dinosaur suspected to feast on nuts and seeds. But the parrot reptile had more than an unusual diet--this species had a different way of eating than other dinosaurs did. Like a parrot, P. gobiensis had powerful jaw muscles attached to its cheekbone, which helped its bite pack a punch and allowed it to shear tough plants. The first dinosaur suspected to feast on nuts and seeds? That sounds like a rather cavernous failure of previous paleontologists' imaginations. And again, always comparing to previous dinosaurs, moving us narratively along a string of 'discoveries' only a couple centuries old. Paleontologists are making history again in the dino-laden fossil beds of northwest China, home of the oldest tyrannosaur and horned dinosaur. A team of American and Chinese paleontologists, including James Clark and Xu Xing, discovered a theropod, or bird-footed dinosaur, that shows how bird hands may have evolved into those of dinosaurs. Scientists now think that birds lost their outer two fingers while evolving into theropods, leaving them with the three inner digits. Limusaurus inextricabilis sported a fully developed beak, a gimpy, reduced first finger and an enlarged second, indicating that limusaurus was in a transition period from bird to dino-like digits. "Paleontologists are making history again" - what a pun. While roving the hillsides of Montana, Bill and Kris Parsons, a husband-and-wife team of paleontologists, stumbled upon a nearly complete dinosaur skull. It wasn't just any skull--this was a new species of ankylosaur later named Tatankacephalus cooneyorum, or "buffalo head." T. cooneyorum provides a snapshot of how the ankylosaur evolved between the early Jurassic and the late Cretaceous periods. This 15- to 20-foot plant eater was built like an Army tank, covered with protective plates and equipped with a clubbed tail. If the ankylosaur felt threatened, it could flatten to the ground, tuck its head in close to its body and use the facial spikes adorning its cheeks and near its eyes to protect the vulnerable parts of its neck. How could anyone write this without some kind of preface that it's speculation?! 2009 being allegedly the year when an actual dinosaur skull was found rather than 'reconstructed', this story smells like 'Bigfoot' level of hype and conspiratorial drama - a new style of dinosaur story for a new era of fakery? Just a bit of speculation, I could be wrong. Ripping the plains tribes' word for Buffalo (Tatanka) also seems to be a deliberate slap in the face. American Museum of Natural History paleontologists Michael Novacek and Mark Norell found an eccentric T. rex cousin when on an expedition in Mongolia's Gobi desert. Alioramus altai, with its slender teeth, long snout and eight 5-inch-long horns, shows that tyrannosaur species varied more than previously thought . These distinctive skull characteristics, never before seen in tyrannosaurs, reveal A. altai to be an entirely novel variety of dinosaur, shocking scientists who thought they knew the T. rex genre well. Researchers used CT scans of the carnivore's brain followed by bone microstructure analyses to identify the discovery as a 9-year-old dinosaur teenager, about 85 percent of its adult size. They thought they knew him so well. What a pity! We are so reluctant to let go of our illusions, aren't we? But we must all grow up and eventually realize any time an article in Popular Mechanics writes "scientists think", that's what science is. Dividing and multiplying the dinosaur family constantly -- this seems to be the amazing "serendipity" of each "discovery" wave. A team of Chinese paleontologists led by Xiao-ting Zhao discovered a species that puts another feather in the cap of bird-dino evolution theory. The new feather-clad find, dubbed Tianyulong confuciusi, was an herbivore with a slight build, signaling that the very first dinosaur had had skin protrusions akin to feathers. This means that all dinosaurs may have evolved from a common ancestor. To find out, scientists need to know whether T. confuciusi's feathers grew from the skin's surface or from the tissue below the skin. Unfortunately, the final answers to the feather puzzle don't lie in fossils. For now, T. confuciusi has ruffled an otherwise blurry picture; feather origins remain a mystery. And if there is a "puzzle" to the feather idea, and it doesn't lie in the only scientific evidence of dinosaurs (namely, the alleged fossils) then where did the "puzzle" come from in the first place? This smells very fishy - like a plot twist decided prior to any real reason for it; priming us for some future time when feathers will conveniently be determined (by thinking scientists ) to be an irrevocable fact about these mysterious monsters. Not fossils? Then, what? Further and further speculation upon previous speculation? The ever-promised dino DNA and official excuse for tampering with genes? A Chinese-American team of paleontologists, including Mark Norell and Peter Makovicky from the American Museum of Natural History and the Chicago Field Museum, found what appears to be a bizarre mix of ostrich and dinosaur. Their find, Beishanlong grandis, is the biggest species of ornithomimosaur (also known as an ostrich-mimic dinosaur) discovered to date--it had an estimated weight of 1400 pounds. Although this toothless omnivore was enormous, scientists don't think it was fully developed when it died; growth-line counts on the bone microstructure analysis indicate that it was still rapidly getting bigger. Ostrich-mimics are superficially similar to modern-day ostriches, but that's where the resemblance ends. Beishanlong had claws up to six inches long and very powerful forearms that indicate digging skills, but these giants didn't bury their heads in the sand. What can this gobbledygook actually mean? Something superficially resembles something, but there is no actual resemblance. Doesn't superficiality mean resemblance? Are they just trying to conjure up the image of an ostrich, then banish it, as a kind of power of suggestion mind game? Of course the entire problem with the "scientists" thinking this, that or the other is that not a shred of it has come with any citation. Where is the citation?! And given we find the original media around it, will we find that the things they write so confidently about in PM are actually written more speculatively and tentatively in the original source? And given we look at citation in that source, if there is any, will we find that it too is based on guesses, speculations and fanciful imaginings of the wide-eyed businessmen selling "dinosaur bones" to an elite society of the scientific establishment? Where is the science in Popular Mechanics articles of this caliber and/or its ilk? They may as well have written about the finest new soft drinks of 2009, and it would have included less hyperbole, hucksterism and fanciful fraud because of laws about false advertising. I find it puzzling the way the academics are currently pushing the bird-dinosaur concept but I agree that it seems to be an attempt to equate dinosaurs with our present day world for some reason. Maybe the entire propaganda punchline will become clearer in time. A Chinese farmer claimed he found the fossil and sold it to a dealer in 1999. It seemed to show an animal that was half bird and have dinosaur. National Geographic Magazine featured it in their magazine and it was hailed as the “missing link” of dino-bird evolution. Shortly after the article was published it was revealed that the “fossil” was a fake. It was actually two fossils of different animals intentionally stuck together before being sold by the Chinese farmer and NG had to print a retraction of the piece. But, this is far from the only example of flaky dino-bird fossils. As this wiki page notes, most of this type of fossil comes from China which has a well know reputation for producing fossil fakes. Searching the web for “fake Chinese fossils” brings up a long list of references. China recently enacted stiff laws against unauthorized sale of fossils but they don't apply to selling fakes since those are not real fossils. One Chinese paleo researcher went on record as saying that 80% of the fossils on display in Chinese museums are fake! If their museum professionals can't or won't distinguish between real and fake fossils, I wonder what that statistic is for the western world. Perhaps no other source for fake fossils has posed such a problem as exists today with fossils from China. We must preface this section to say the fake Chinese fossil market is becoming increasingly sophisticated and changing so rapidly that any fossil now originating in China should be approached with caution. Yet most of the "fossil evidence" for the dino-bird connection comes from China.